This item is repeated on the St Andrew's church page in the Churches and Memorials section, where there are more details and documents connected to the case. This is a subpoena to Thomas Hamlyn, carpenter, to appear in Exeter as a witness to a dispute that I have called The Pew War. Two men, John Edmonds and James Fursman wanted to build a pew or pews in the south aisle of St Andrew's Parish church. 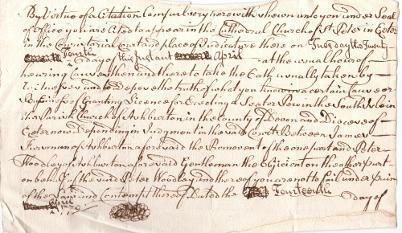 Peter Woodley, of Halsanger Manor, claimed that he had sole use of the pews (and the burial rights) in the said aisle.